We are assuming application of 3000 gallons/acre of cattle slurry. Results from Teagasc have shown that up to 85% of the Phosphorus (P) in slurry can be taken up and used by the soils. The Nitrogen (N) levels used assume that slurry is applied in early March and thus supplies approximately 8 units Nitrogen (N) / 1,000 gallons. 1000 gals of slurry applied in March = 50 kg bag of 8:6:39. Slurry applied in mid – summer would give Zero Nitrogen (N) value. The recommendations given above for nitrogen and phosphorous are the maximum permitted. For all situations, apply C.A.N., Sweetgrass or Urea to satisfy the extra Nitrogen requirement as recommended by your advisor. 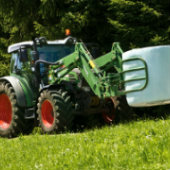 Richland: 22.7 – 2.5 – 5 + 3% Sulphur (S) + Copper (Cu), Manganese (Mn), Magnesium (Mg) and Zinc (Zn).This product is ideal for supplying N, P, K and essential trace elements for growing top quality grass and silage. Sweetgrass: 23% Nitrogen (N) + 2% Sulphur (S) + 1.2% Magnesium (Mg) + 5% Sodium (Na).This product is especially formulated with the grass farmer in mind. The Sulphur and Magnesium will help to increase grass protein while the Sodium will encourage cows to have higher dry matter intakes, making it an excellent product for growing top quality silage.